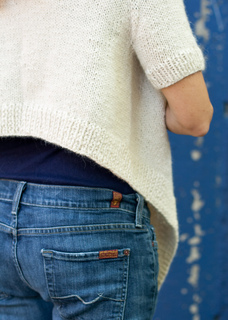 This is a basic cardigan with a lot of options. A subtle smocked pattern adds a little texture to the neckline if worn closed, and serves as a border if the fronts are left to hang open. It can be pinned up, pinned across, pinned at the center, belted, thrown over a shoulder, or left to hang. 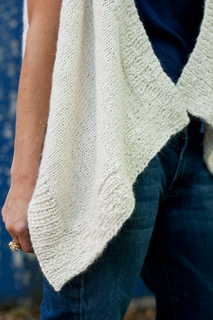 This design balances a drapey shape with a little structure, as I was trying to knit a loose and flowy cardigan that wouldn’t overwhelm a small or curvy frame. It’s fitted through the shoulders, short in the body and has a little bit of shaping above the waist. Although mine was knit in festival yarn, the Ultra Alpaca is a perfect match - it’s the perfect weight and texture and has a soft drape. If you are subbing yarn, go for something similar. Also, my testers were split on needle size to get gauge, so go with whatever works for you.